There are many travel packages available for Las Vegas in Nevada, USA. Travel packages are the ideal way to book a trip to Las Vegas, Nevada as they include hotel, flight and special coupons. The Forum Shops at Caesars Palace is a small part of the fascinating sights to see when you travel to Las Vegas.The Forum Shops at Caesars Palace have been opened since 1992 and you will find some intriguing stores when looking for the perfect package. You will also find many retail shops, dining and entertainment establishments. Additions continue to be added to the shopping plaza and it is considered to have the best selection in Las Vegas, Nevada.The packages offered by travel companies usually include a stay at the world renowned Caesar's Palace. It one of the finest luxury hotels in Las Vegas with a shopping mall attached.The best way to travel to Las Vegas is to choose from the numerous amounts of travel packages available.The Forum Shops, Caesars Palace Las Vegas Resort Hotel and Casino, Vegas Strip, Las Vegas, Nevada, USA, North America. 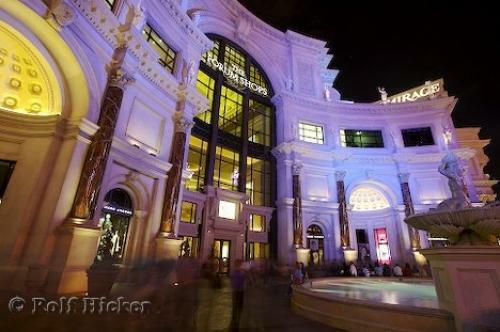 Photo of the exterior of the Forum Shops in Las Vegas that you can see after booking your travel packages.